After a promising first half, the Giants made too many mistakes as the Cardinals beat the Giants 24-17. After a scoreless first quarter, the Giants got the first punch, scoring on a 4 yard run by Brandon Jacobs. 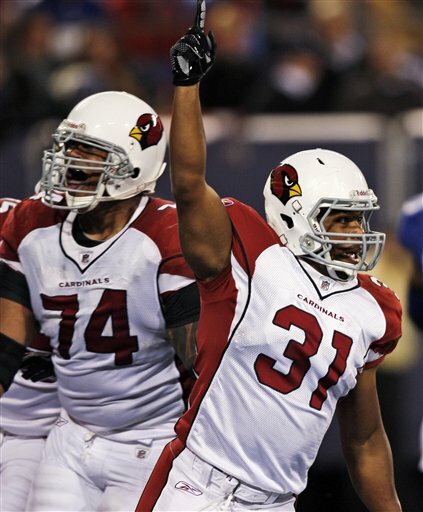 The Cards wouldn’t stay down for long, when they scored on a 13 yard run by Beanie Wells. The Giants answered again on a fluke 62 yard touchdown by Hakeem Nicks, that went off of Mario Manningham and right into the hands of Hakeem Nicks, to give the Giants a 14-7 lead. Neil Rackers kicked a 30 yard field goal at the end of the half. The Cardinals scored first in the second half, on a 1 yard run by Tim Hightower, to give the Cards their first lead. After an Eli interception, the Cardinals scored again, this time on a 6 yard screen pass to Jason Wright. Lawrence Tynes connected on a 20 yard field goal midway through the fourth to bring the Giants within a touchdown. The Giants attempted a valiant comeback, but another interception by Eli cost them. The offense started off strong, and Brandon Jacobs looked like his old self. Inexplicably, they couldn’t get anything gong in the second half, and Eli made many mental errors. Steve Smith was a non factgor, and Ahmad Bradshaw could not get anything going. One of the Giants touchdowns was that fluke play to Nicks. This was a dismal performance by the Giants offense. The Giants defense was a bit better, but they couldn’t stop Beanie Wells in the second half, who is looking to be the missing piece for the Cardinals. For the most part, they kept Larry Fitzgerald and a hurting Anquan Boldin in check. It was the run game that got them. This is a game that the Giants could’ve won, but too many mental mistakes got in the way. For a usually disciplined team, this is a shocker for the G-Men. The Giants will have a lot to work on before next week’s game against the Eagles.